The City, Metrolinx, and TTC are working together to bring more transit to communities across the City. In October, we will be hosting public meetings to provide information about the new SmartTrack/GO stations being planned in Toronto and to get your feedback. 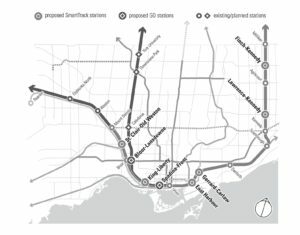 The new SmartTrack/GO stations build upon Metrolinx’s Regional Express Rail program, which includes increased service on five of the existing GO rail corridors. Within Toronto, six new SmartTrack stations are planned for the Stouffville/Lakeshore East and Kitchener corridors and two new GO stations are planned for the Barrie corridor. The City and Metrolinx will be undertaking a Transit Project Assessment Process under Ontario Regulation 231/08 to assess the potential environmental effects of the new stations. At this round of public consultation we will provide an update on project progress and an overview of planned environmental studies and concept schematics. We will be seeking your input on the proposed concept plans and key elements of the project. Information on all the new stations will be available at each meeting, so you can choose the location most convenient for you. For more information, and to submit online comments, please visit www.smartrack.to and www.metrolinx.com/newstations. Just a heads up that City plumbers will be repairing the irrigation system for the Sorauren Off-Leash Dog Area this coming Thursday and Friday (Sept 28 & 29) As a result the off-leash area will be closed for the duration of the work. I appreciate your patience while this work is being done. Come out and discuss the future of Rita Cox Park! A new shade structure is coming and we want to hear your feedback about where you think it should be placed. The meeting will also discuss the by-law enforcement of off-leash dogs in the park. Hope to see you there! Bring your family, friends and neighbours to the party in the park! The bash on Wabash! 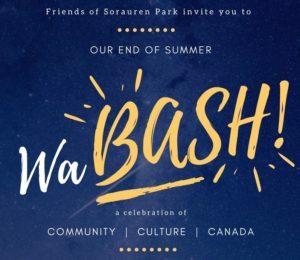 The Friends of Sorauren Park and its partners present The WaBASH Fall Festival, Saturday, Sept. 23 from 4–10pm at the park, 50 Wabash Avenue. Outdoor movies featuring classic Canadian shorts and the Oscar-nominated Fly Away Home… the final outdoor movies of the year. Visit the WaBASH event web page for full event programming and updates. The Invictus Games are coming to Toronto and with it some exciting events. The Cycling Time Trial event is Tuesday September 26, 9:00 am to 2:15 am and the Criterium event takes place Wednesday September 27, 9:00 am to 5:00 pm. Admission is free and no tickets are required so stop by and watch! More information is available on the Invictus Games website. Off-leash dog walking will not be permitted on Spring Rd. during event times. Dogs must on a leash at all times during events. Consider using the TTC, cycling, or walking to the park on these days. City of Toronto and LEAF have been working to establish a more collaborative approach to commercial street tree stewardship in Toronto, enabling communities to take action and directly help the urban forest flourish. 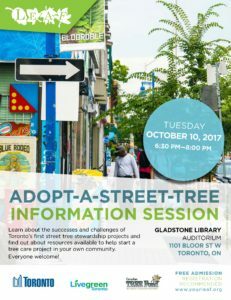 Join us on October 10th at the Gladstone Library from 6:30pm to 8:00pm to learn more about the successes and challenges of commercial street tree stewardship and find available resources to help start a tree care project in your own community. To learn more and to register for this free event check out LEAF’s website. Help collect native plant seeds to be used in next year’s plantings at the High Park Stewards’ restoration sites. Candidates include native grasses, such as Canada wild rye; little and big bluestem; and Indian, bottlebrush, and panic grass. There are also wildflowers, such as cardinal flower, harebell, milkweed, black-eyed Susan, cup plant, woodland sunflower, and many others. Meet in front of the Grenadier Restaurant at 10:30 am, and go together to the site. All tools will be provided. Upon completion of the Study, City Council passed By-laws 1049-2013 and 1050-2013 placing certain restrictions on restaurants such as limiting their size and location within a building. Additionally, these By-laws placed a maximum on the number of restaurants permitted to be located in Areas A-D (as found on the map on the opposite side of this page) limiting the concentration of restaurants to no more than 25% of the properties within each of these areas. To speak to the planner directly, contact Joanna Kimont at (416) 392-7216 or joanna.kimont@toronto.ca. You may also mail your comments to the planner at Toronto and East York District, 100 Queen St W Floor 18 E Toronto On, M5H 2N2. You may contact my office at (416) 392-7919. Construction for the Chelsea Park Playground project is scheduled to commence on September 25! We anticipate construction to be ongoing throughout the remainder of the 2017 construction season, but our goal is to have the park ready prior to the 2018 swimming season. The scope of work includes removal of existing playground & installation of new playground, upgrades to the existing wading pool, a new walkway, benches, picnic tables and a water bottle filling station. The Economic Development and Culture Division is developing a new, integrated Divisional Strategy to further the vision and goals of the City. Their two current strategies, Collaborating for Competitiveness (2013) and Creative Capital Gains (2011) have guided EDC’s strategic focus over the last six years. During that time, EDC has made great progress implementing the recommended actions and identifying lessons learned. The Division is now undertaking a review of current activities – consulting key stakeholders as part of the process – to develop a new, integrated Economic Development and Culture Divisional Strategy to further the vision and goals of the City as set out in the above strategies. The purpose of the new Divisional Strategy is to develop a framework of focus and establish Divisional priorities over the next five years (2018-2022), drawing a link between culture and economic development. It will include actionable recommendations for the EDC Division and will seek to advance inclusive economic and cultural opportunities across Toronto. Public Consultations for the new Strategy begin next week and will be held across multiple locations. Full Details and registration information are available here. The Division has created a Conversation Guide that highlights key emerging economic and cultural trends and challenges facing Toronto and it is now posted online. You can respond to the Conversation Guide by completing an online survey or providing a written submission by October 9, 2017. The Conversation Guide and survey are available here.